After our sedate start to the weekend it was time for the main event – THE Eternal Derby (I know we say that whenever we see Roma v Lazio, AIK v Djurgarden and Canvey Island v Concord Rangers). 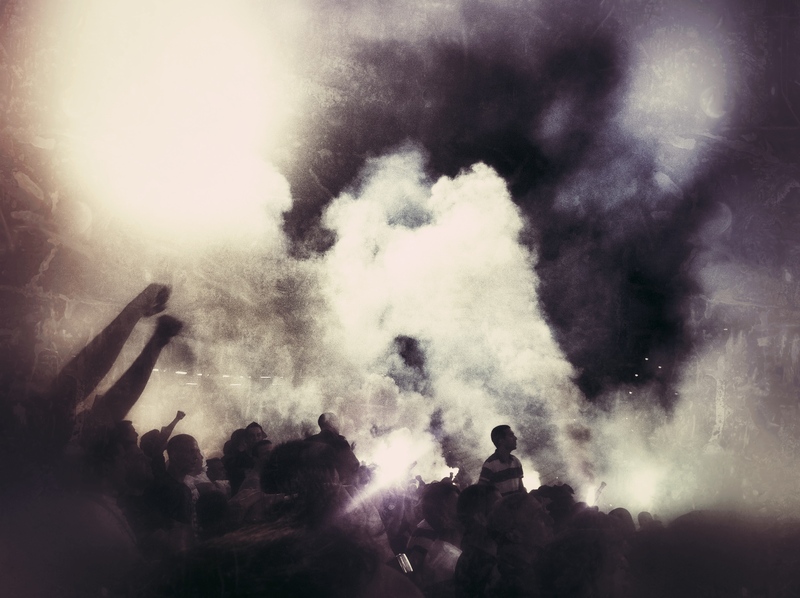 Let’s face it – who wouldn’t have wanted to be in the thick of thousands of fanatical fans holding up their flares at this one? Well, having suffered with a chest infection for a week, it wasn’t the wisest idea for me to be taking in huge lung-fulls of acrid smoke, but that is why God created Amoxicillin right? Once you have experienced the atmosphere at one of these games you cannot wait for your next fix. It is like a drug and your dealer is Danny Last. The police presence around the ground was organised and very visible. The riot police had been deployed in units of ten at almost every junction, meaning a very quick reaction to any trouble if it kicked off. Entry into the ground was also smooth without any of the hassle we have experienced elsewhere in the world. So to the game itself. 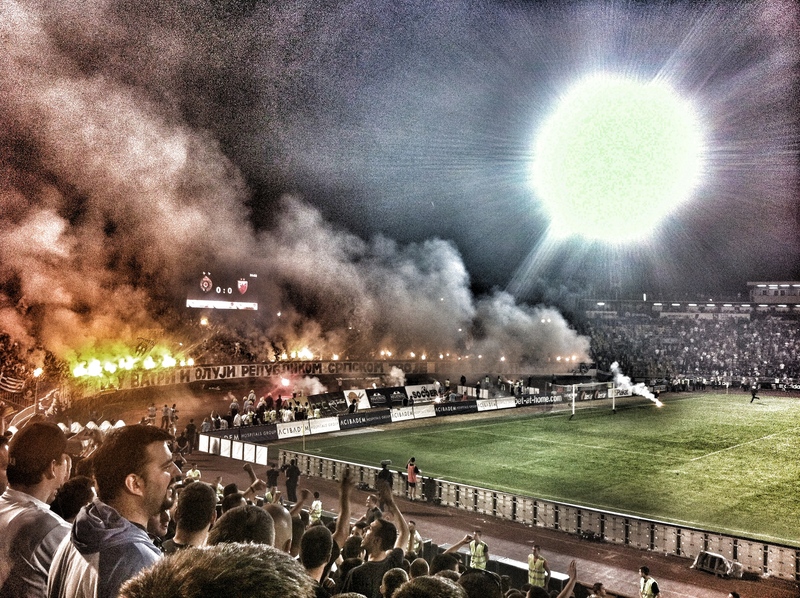 Partizan had won the league the previous week and had agreed to keep any celebrations low-key in such a tinderbox atmosphere. Fat chance of that with the fans organising their own celebration with banners mocking their opponents as well as more than a few digs at manager Avram Grant. Ah, Avram (and by digs I mean coins, lighters and kitchen sinks being thrown at him as he exited the pitch at half time). How we miss your wonderful cheery personality and clueless tactics from East London. It is good to see you retain your popularity oversees. The game itself wasn’t a classic. In fact it was a shocker. Neither team could improve their league position and so with Champions League qualification already sorted it became a bit of a bore draw, only livened up by the antics of the fans at either end. In fact you could have quite easily suggested (as we did) that a 0-0 draw had been agreed beforehand just to keep all of the natives happy. But then just as we were looking forward to a quiet night in the town centre, Red Star’s Cadu popped up and scored in the third minute of injury time. To say the place went mad is a bit of an understatement. 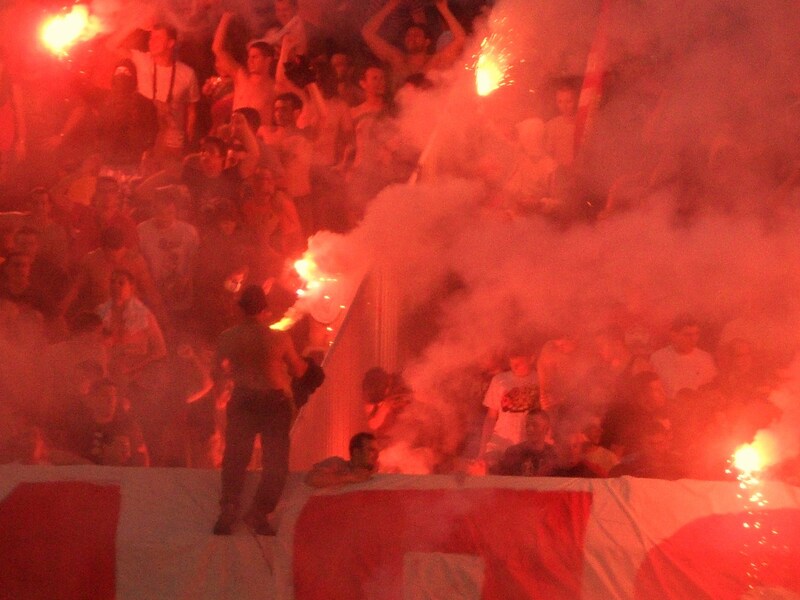 All of a sudden the Red Star fans flowed onto the running track, mobbing the players. The brave referee tried to get them back to restart the game but after a few more seconds of play he called time on proceedings and ran for cover. Queue even more celebrations from the Red Star players in front of their fans. It was as if they had won the league, rather than just the bragging rights for the last meeting of the season. Players, some almost stripped naked by the fans sprinted for the tunnel and the away fans decided to set fire to a few seats to celebrate. Again, organisation outside the stadium was efficient and we saw no hint of trouble. In fact within thirty minutes of the final whistle we were back in the bar with Red Star’s biggest fans (Nenad and of course Andy Hudson). For all the colour of the game click here. A few more two pound beers (we were paying the premium for drinking in the Irish Bar by this point) and it was time to bid Belgrade a good night, ready for what tomorrow would throw at us. Day three of the adventure began with a civilised breakfast. It was voting day in the Serbian Elections and our choice of candidate Jadranka Šešelj (purely on looks I hasten to add) although after we discovered her husband is on trial at The Hague for war crimes we revoked our support and hoped that politics was the winner instead. 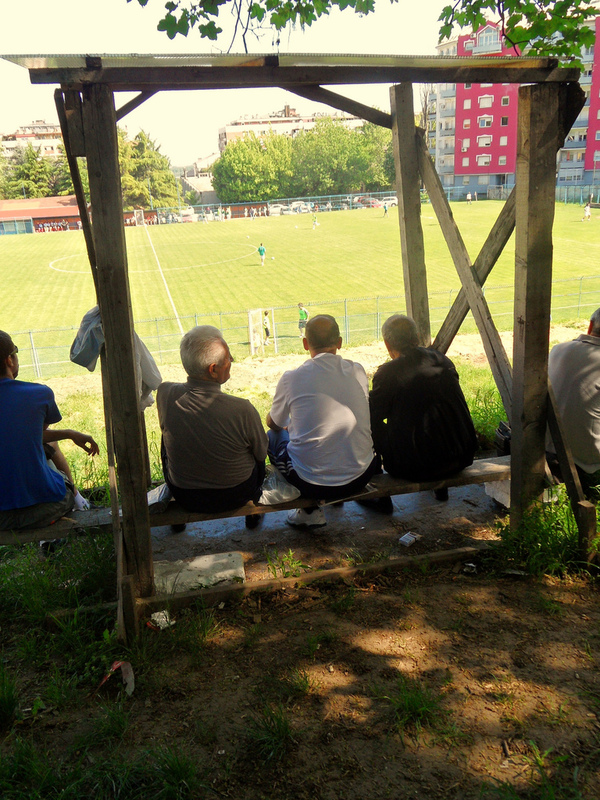 For us it was more football (of course it was), starting off with a trip to watch FK Belgrade in the third division. There are few grounds in the world where there is little point in charging people to get in, but this was one. At either end of the ground were tall blocks of flats, offering perfect views of the game to any residents. On one side was a grass bank where at the top, through a magic door, came the fans in their droves for this Sunday morning game. Apart from a makeshift wooden structure that could seat three old chaps, everyone else stood up. I couldn’t see the logic in this – the grass was dry, it was in the sunshine and soon enough those Енглисх будале (English fools) were lolling around on the floor. I mean it wasn’t as if we ended up falling down the bank or anything remotely embarrassing. This was level three in Serbian football, and if I was going to have to compare it to anywhere in England, Whitehawk from the Ryman League would come to mind, although the caravan park doesn’t really translate well in Serbian. The officials led the teams out of a little house in the corner of the ground – hang on – here was a first. A female referee and a linesman. The latter certainly pulled off the whole “woman in football kit” look from our vantage point. All three officials (and let’s big up Mr Linesman here too) allowed the game to flow and it was certainly an enjoyable Sunday morning run out. However, one is never enough on these trips, so before you could say Време аддед он we were off, hailing down a taxi to take us across the city to the Zârkovo for their game. So off we went, driving past the new bridges over the rivers that were destroyed by the NATO bombs in the early Ninties, waving a “hello” at the World Rowing Championships (“Go Team GB” or something) before the taxi driver turned with a confused look. He simply couldn’t find the ground. “That’s no problem – we can ask Google Maps”. Oh how this would bite me on the arse later. But for now we located the ground, paid the cab and went in search of game number 6. Except game number six wasn’t there. Nothing was there. The ground was just empty. Step up Uncle Google – there was the ground about “5 minutes on the right”. Twenty minutes later and still no game. To shorten a long story we never did find the ground or the game despite Google’s help. Time for lunch then and a plan B. 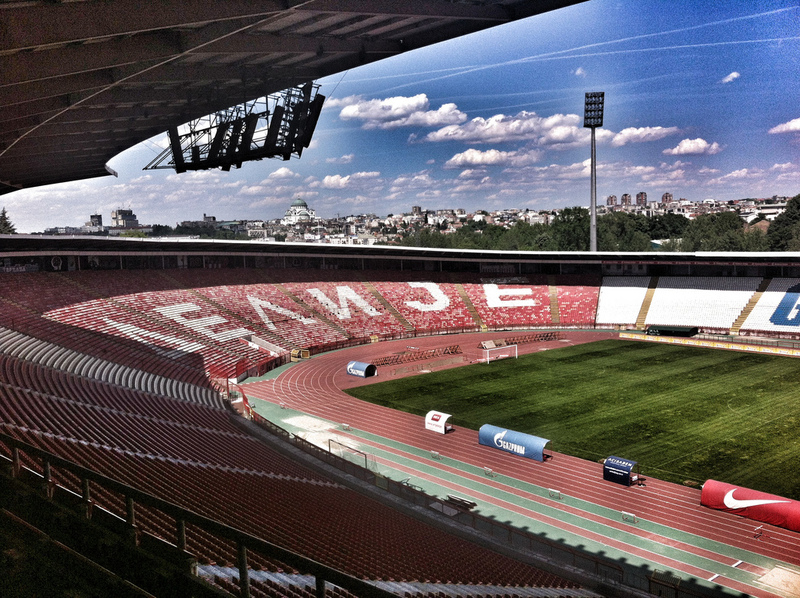 Plan B was a visit to Red Star’s Marakana stadium, the spiritual home of football in what used to be Yugoslavia. Once the stadium literally shook to the sound of over 100,000 fans on regular occasions, making it one of the most intimidating places for visiting teams to come to. 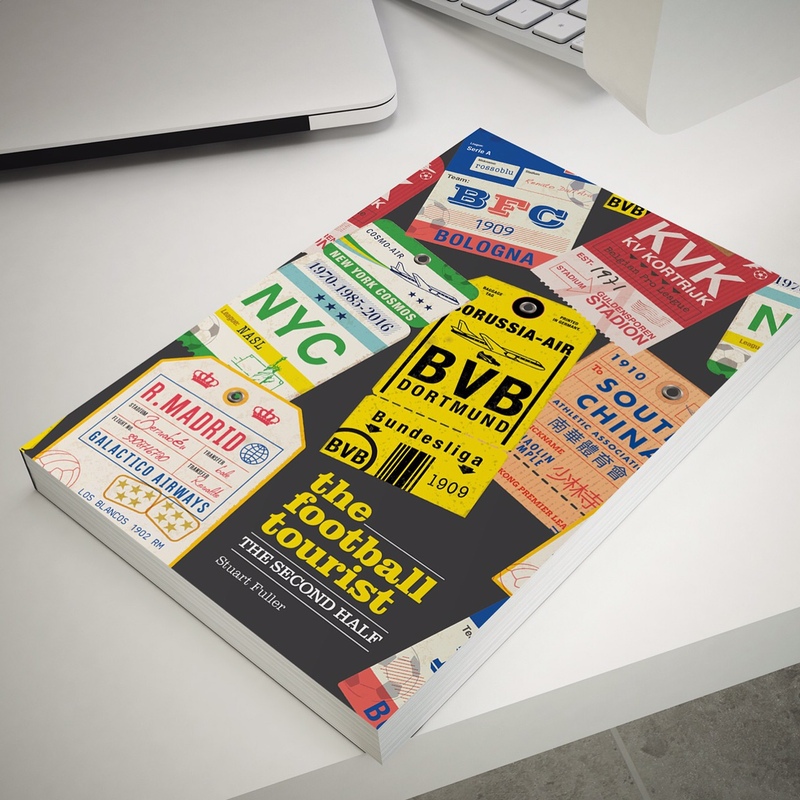 The infamous Busby Babes team played their final game before the Munich Air Crash here in 1958; The 1973 European Cup final played here saw the legendary Ajax team beat Juventus and in 1976 it hosted the finals of the European Championship, won by Czechoslovakia. But it was closed. Closed is not a word in our vocabulary. Just ask the question is our mantra and our response was that for a price (£8.33 to quote latest exchange rates), the door not only to the stadium, but also the press area and the Executive lounges swung wide open. Hello boys. So what does one do when you have got into one ground? Try another of course, and so we set off down the hill to Partizan’s stadium. The two grounds are separated by about 500 yards in one of the closest top level rivalries in European football. The clear up operation was in full effect and so we decided it was beer o’ clock and headed into the courtyard adjoining the ground. Hello, what’s this? Of course – a magic door and even a guide to boot who didn’t need a top up on his pension. As we left we saw a troop of players leaving the stadium, all kitted up. Partizan Under 18’s no less off to play a game in the Military stadium just down the road. 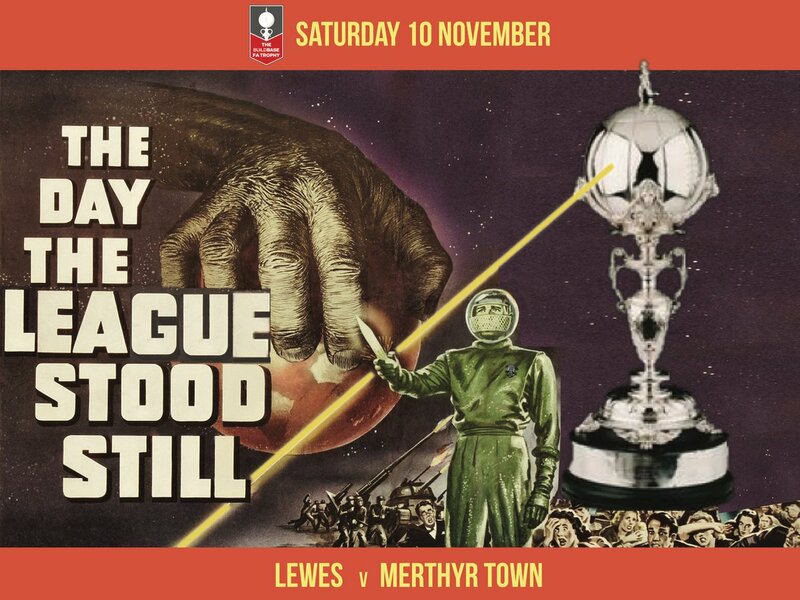 Well, it would be rude not to drop in on that one, although we have no idea who they were playing and what the score was so I am loathed to count that as number six for the weekend. The rest of the day was spent wandering the sites of the city, a beer, some Serbian food, a beer, a little rest, a beer and so on until that 4am wake up call drew us back to the hotel. Serbia had been a fantastic experience, with hospitable people, prices to make you rub your eyes and a derby day experience that is up there with the best in the world. Yes please. Oh – one word of warning. Despite what you may believe, Serbia is no longer in Europe – well, that is according to T-Mobile. After landing at London Luton (and having a spare hour waiting to get through UK Border) I checked my phone usage. £670 in mobile roaming charging in TWO DAYS! This is because Serbia is not included in T-Mobile’s European data pack which I subscribe to AND would have warned me when I get to a certain threshold. But no – according to T-Mobile the use of apps like Google Maps (as used on Sunday morning) this data was not included. Be warned! This entry was posted in European Football and tagged Avram Grant, Belgrade, FK Belgrade, Marakana, Partizan Belgrade, Red Star Belgrade, Serbia. Bookmark the permalink.